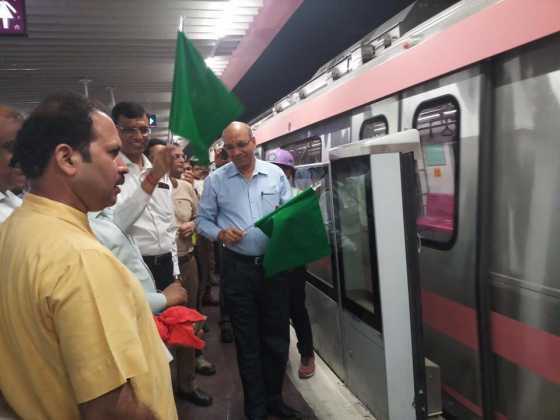 New Delhi: The Delhi Metro Rail Corporation (DMRC) today started test runs on the 8.10 kms stretch between the Lajpat Nagar and Sir Vishweshwaraiah Moti Bagh section of the upcoming 59 km long Majlis Park – Shiv Vihar corridor (Line 7) of Phase-III, also known as the Pink Line. 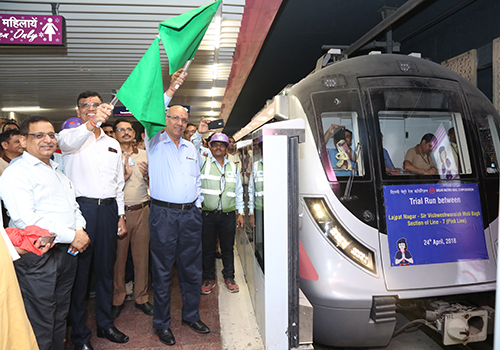 The Test Runs were flagged off by Dr. Mangu Singh, Managing Director, DMRC in the presence of other senior officials. 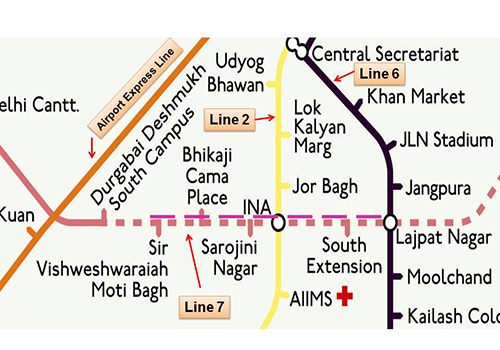 This stretch, which will be a continuation of the presently operational Majlis Park – Durgabai Deshmukh South Campus section, will be a major boon for the shoppers of the city as four major markets of the national capital, i.e, Sarojini Nagar, INA, South Extension and Lajpat Nagar will get dedicated Metro stations. This section from Lajpat Nagar to Sir Vishweshwaraiah Moti Bagh consists of 6 stations i.e. Sir Vishweshwaraih Moti Bagh, Bhikaji Cama Place, Sarojini Nagar, INA, South Extension and Lajpat Nagar. Out of these 6 stations, Only Sir Vishweshwaraiah Moti Bagh station is elevated and rest 5 stations are underground. 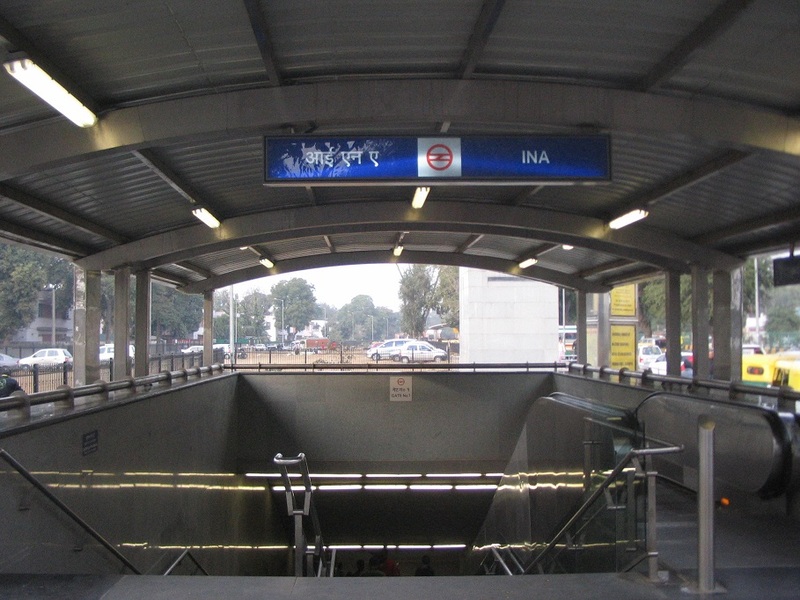 This section has two interchange stations at INA and Lajpat Nagar. The facility of interchange of Metro trains between line7 & line 2 is available at INA and between line-7 & line 6 at Lajpat Nagar Station. The Lajpat Nagar Metro station will emerge as one of the most important interchange hubs of south Delhi. Here, commuters of the Pink Line and the presently operational Violet Line from will be able to change trains. The construction of this interchange in a congested locality along the Lajpat Nagar market was a major challenge for DMRC’s engineers. The alignment of tunnel between the South Extension station & Lajpat Nagar station is below the existing elevated Lajpat Nagar station and it crosses between piers of elevated station of the Violet Line. The drive of Tunnel Boring Machine between existing RCC piers was very critical and needed meticulous planning and monitoring. Being in the vicinity of one of the busiest markets of Delhi (known as Central market) and surrounded by the residential buildings in the close vicinity, creating space for construction and traffic decongestion was major challenge. The construction of an underground Nallah (6.7m x 3.3m) crossing the cut & cover area was one of the challenges as it was first dismantled and then reconstructed on piles to facilitate the construction of tunnel box underneath. INA is a very important location in terms of connectivity to the nearby areas of Delhi. It is a mix of residential and shopping areas like Sarojini Nagar, Laxmibai Nagar, Dilli Haat etc. The INA station of the Pink Line is an interchange station with the Yellow Line station. 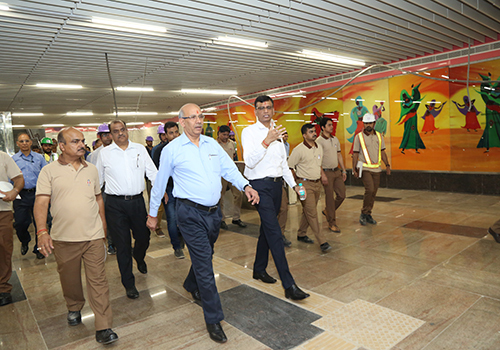 The new station is at 90 degrees to the existing station and this is for the first time in the history of the Metro construction that a station is built over the existing tunnel connecting the operational INA and the AIIMS Metro stations. This is also probably the first time in India that a ‘Cut & Cover’ construction was done over the existing operational tunnel. 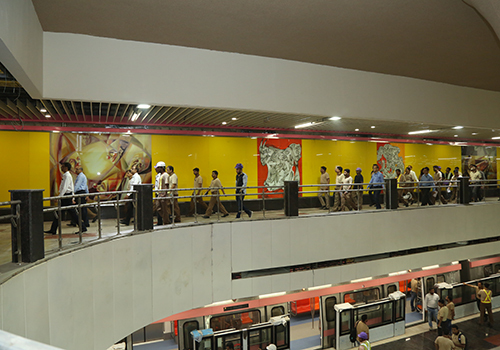 INA Metro station of Line-7 (Majlis Park – Shiv Vihar) is an interchange station providing seamless connectivity between the existing INA station and the new station. From the underground station perspective also, this Metro station is unique as the platform has been constructed above the concourse level for the first time in Metro construction. This implies that the platform is at the first level of this underground station (called basement level 1) while the concourse level has been shifted below the platform at the base level. For example, If one passenger wants to interchange from the new INA station to the old INA station, then, he has to go down from the platform of the new station to the concourse level and from the concourse he will be connected to the concourse of the old INA station through the common interchange area. This was done here because of the height variation between the existing INA station and the upcoming new INA station owing to the already existing Metro tunnel at the location. DMRC had to modify the station design to adjust to the new circumstances. This is, probably, for the first time in India that a cut and cover construction has been done over the existing operational tunnel. So, there is one point where trains of both the lines and the concourses would simultaneously operate on top of each other. For interchanging (i.e. going to the already existing INA station), the commuters will have to go to the concourse/base level of the new station and then go to the existing INA station.